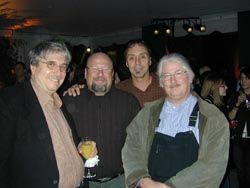 Berkow (second from left) at Meyer Sound's 25th Anniversary Party in 2004, with fellow gurus (left to right), the late Don Pearson, Elton Hally, and SIA Software co-founder Thorny.SCN: What first sparked your interest in acoustics and sound? Sam Berkow: I have always found sound in general, and music in particular, intriguing. For me, finding ways to balance my interest in engineering and design with aesthetics has always been important. I could never be a serious artist like a painter, as the painting has no function outside its aesthetic. I am intrigued by the need to balance form and function. I tried my hand at photography, but this was before Photoshop and similar digital tools were around (sheepishly admitting my age) and dealing with the developing chemicals was not all that much fun for me. I started mixing bands in high school and college simply because I was a crappy musician (to this day one of my great disappointments) and wanted to be around musicians and the music scene. For me, designing spaces for either recording or performance is the best balance of form and function, where aesthetics are the driving force, and I can make a real contribution to the process. While many people know me as the developer of SIA-Smaart, the work that I do is mainly architectural acoustics, which really makes you think about the definition of successful design. SCN: You're not just a bench-tech software guru, you've worked FOH and recorded some pretty amazing musicians. How does your interest and involvement in music fuel your work? SB: I spend my time designing so I can spend time hanging out and working with great musicians and engineers. For me, the bench work assures that I have something real to offer to the musicians, engineers, and designers I work with. I spend an inordinate amount of time listening to a wide range of musical styles, and trying to understand them. Being able to communicate with musicians about musical ideas is great. Being able to make technology less intrusive or disruptive to the musical process is where I can really contribute. I enjoy mixing, particularly live, but after a limited number of tour-bus experiences, I realized that living in a tour bus was not the way I wanted to live (although the first few weeks on a rock tour were really fun). I have been extremely lucky to have traveled with some great musicians... and have some really crazy fun! SCN: What convinced you to develop the SIA-Smaart acoustic measurement and sound system optimization software? SB: For me, SIA-Smaart was again a way to work with people I wanted to hang out with. I had already spent years as an acoustical consultant and I was aware that many system engineers and consultants were frustrated by the gulf dividing people making test equipment from the needs of working concert sound engineers and room designers. As someone who wanted to gather data about real concert rooms, Smaart was a tool that I needed. The test manufacturers at the time were more interested in serving loudspeaker designers and academics and they were not focused on creating practical tools for people looking to measure room acoustics or optimize concert sound systems. People like the late, great Don Pearson of Ultrasound needed better tools and I was happy to spend time with Don and others to learn what they needed and try to provide it! I was also lucky to find that a large number of people in our industry are happy to share what they know if you just ask! Thorny (with whom I co-founded SIA Software Company) was also looking for better tools for his work with the Three Tenors and Luciano Pavarotti, and it was a pleasure to work with him. SB: I think overall sound quality is better, as systems are better tuned, by a large and growing number of skilled system engineers. Clearly a number of system measurements, which were once almost 'mystical' and only vaguely discussed or rarely used by mixers and tour sound guys have become largely 'demystified', and are being used by a large number of people on a regular basis. I am extremely proud of helping to bring practical tools and some additional understanding to a large number of people. I am also often warmly welcomed at FOH positions, which is a great perk! SCN: You list some amazing avant-garde musicians as among your favorites. As technology continues to evolve, how do you think music will change? SB: Clearly musical distribution is changing and that change is much needed, but how the actual music is changing is harder to see. Musicians tend to use the tools they feel comfortable with, and more and more musicians have become comfortable with computers and DSP, so almost anything is possible. There is a concern, particularly in the jazz and classical worlds, that more time with computers and technology, can lead some musicians away from practice time with their primary instruments (or composers away from really finishing their works). One very interesting development is the decrease in the number of studios with large studio spaces, and more and more people playing their parts separately or simultaneously, but in separate locations-which is at best a mixed blessing. I do notice that the attention span of musical ideas seems to be compressing, with more and more ideas given less time to develop within a piece of music. I find this development rather sad. However there are so many people making such interesting music, I am optimistic that the future will be filled with great new musical ideas designed to thrill and/or move us. I am almost always interested in hearing new music, both performed live and recorded onto... (insert who-knows-what format here)! When I first started in this business... I had long hair and work was fun. Now I have almost no hair and work is (mostly) still fun, and the tools available for almost every task are much better! If it doesn't sound good...take a deep breath, stay calm, and start going through the system piece by piece. Careful listening and critical thinking can solve almost any sound problem (the only question is, will the solution come quickly enough). One of the best recordings I've ever heard (and you probably haven't) is... Rachmaninoff: Piano Concerto no. 3, Arcadi Volodos, James Levine. I found this amazing to listen to! Another interesting album is: Ali Farka Touré/Toumani Diabate, In the Heart of the Moon-an acoustic duo, guitar, and kora-the sound itself seems to be part of this performance. I do keep a list of favorite recordings and artists on my website. Touring is...really fun for the first few weeks, after that, I'd rather let others ride the bus and fly out to meet them.